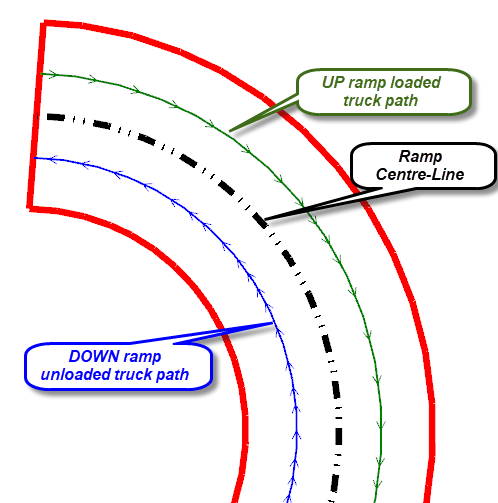 Being a curious kind of bloke, I was wondering if the industry standard practice of modelling trucking using the ramp centre-line, versus using the actual truck path was an issue or not? 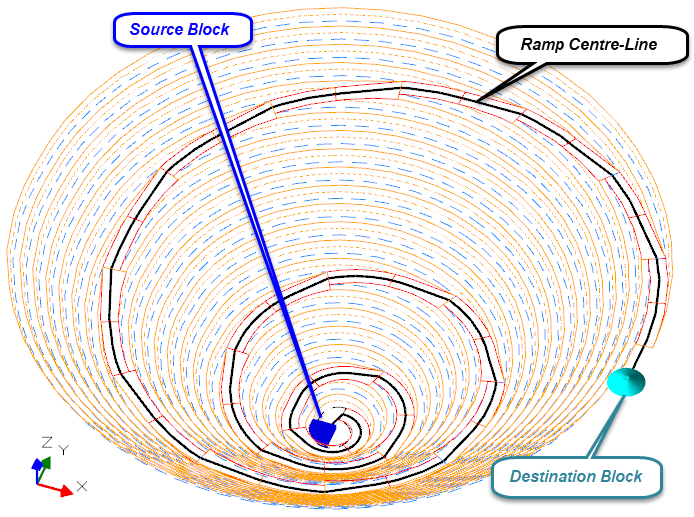 Spoiler Alert (for the impatient): For a circular pit with a spiral ramp, the difference (in modelling) is insignificant at around 0.9% in total ramp travel time for a block at the bottom of a 50 m deep pit reducing to 0.5% for a block at the bottom of a 300 m deep pit. (And the tonnes-weighted time difference for all blocks in the pit will be very much less). What I mean by the above question is: (referring to Figure 1) Is there a difference in modelling the truck hauling loaded up the design ramp centre-line and then down the ramp centre-line (which is the standard set-up in all trucking models) versus modelling of the actual path of a loaded truck going up-hill (to left of ramp centre-line going up) and the actual loaded path of a unloaded truck going down-hill (to left of ramp centre-line going down)? 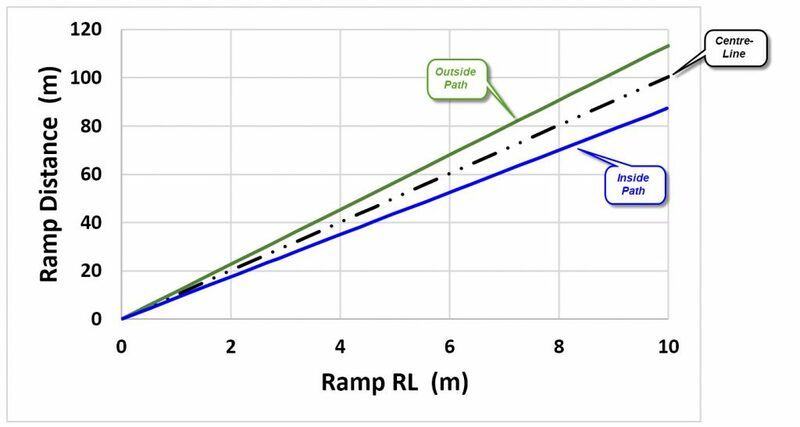 These conditions result in different gradients for the truck path (loaded and unloaded) than is occurring for the design ramp centre-line, as shown in Figure 2 for the first 10 metres in relative level (RL) change. To answer the posed question, a trucking model (using Deswik.LHS) was set up as follows. A simple circular pit was designed with a single spiral ramp at a 10% centre-line gradient to a depth of 400 metres. Ramp was selected to be 27 metres wide to accommodate a Cat 777G truck (100 short ton class). Pit parameters: inter ramp angle = 45°; bench height = 10 m; batter angle = 65°; berm width = 10.7 m.
The resulting pit design is shown in Figure 3. LHS model set-up using defaults, except rolling resistance changed to 2.5%. The data for the truck path solution was reconstructed from the relevant sections of the model for the inside path and the model for the outside path patched together. The LHS model set-up is as shown in Figure 4. In preparing the truck paths for LHS modelling, each segment between the individual 10 metre bench segments was “smoothed” to a constant gradient. The gradients of each of the of these segments is shown in Figure 5. The segment gradients appear to change unevenly due to the manipulation of the ramp at each berm intersection. The ramp was flared out to full width as shown in Figure 6. This allows the loaded trucks to follow a smooth path up the ramp. However, this does modify the travel path gradient to be slightly lower at each of the flared segments. The results of the truck modelling are shown in Table 1 for the block at the bottom of a 400 metre deep pit. The key result from this table is that modelling using the truck travel path gives a travel time of around 0.5% less than the centre-line modelled result. Note that when all blocks are mined out of the pit, the tonnes-weighted time difference will be much less, as the upper pit blocks are subject to a much lower gradient difference with respect to the ramp centre-line. 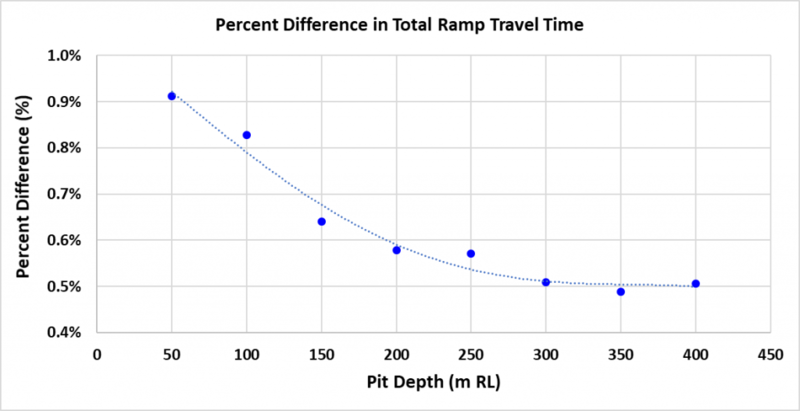 Figure 7 shows the difference in travel times for a range of pit depths (for the same pit parameters), ranging from 0.9% at 50 metres pit depth to 0.5% at 300 metres pit depth. 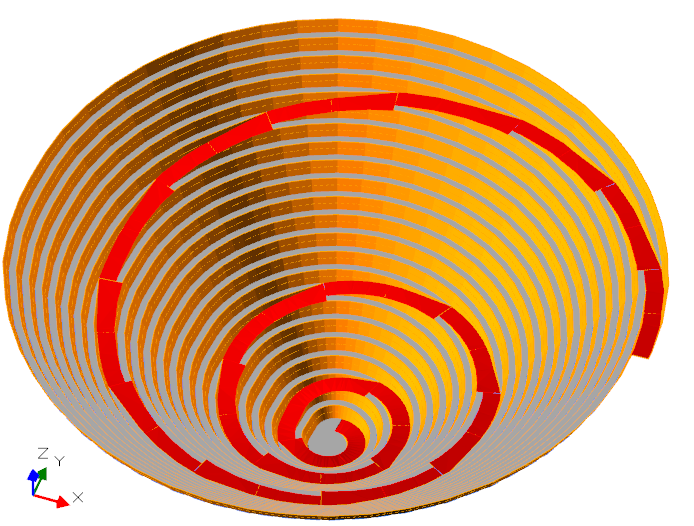 The bottom 100 m of a 400 m deep pit contains only 2.6% of the total mass of the pit, with over half the total mass of the pit being in the top 100 m from the surface, where in this spiral ramp model the difference between the truck path gradients and the centre-line are almost insignificant (with less than 0.2% absolute difference in gradient). 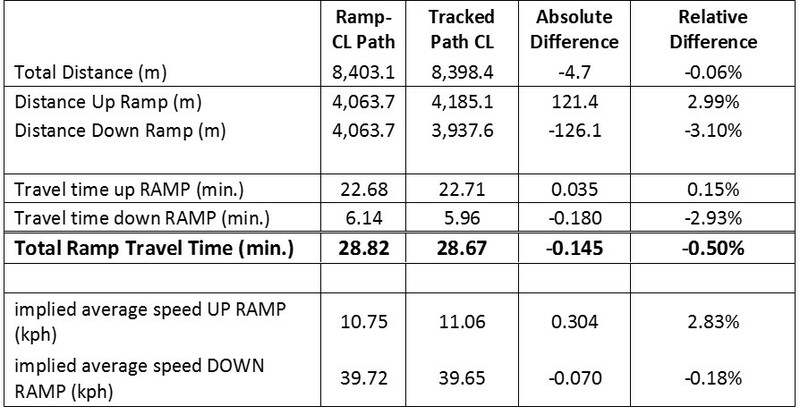 Variation in rolling resistance along the ramp due to time since last maintenance, variation in road sheeting, etc. Variation in road condition – such as rocks on the road, potholes etc., all causing drivers to vary their speed. Bunching of trucks behind a slow truck causing all trucks to lose time, not just the poor performing truck. Inaccuracy in estimating and variations in truck operating time. All these causes of variation will have a far larger impact on the truck hour estimation than the assumption of centre-line travel for modelling. Hence it can be concluded that the estimation of truck cycle time using a ramp centre-line assumption, rather than a truck travel path assumption, is not material to the estimation of truck hours for planning purposes. As a parting note, remember: calibration of your truck hour model will be the key to accuracy and confidence in your truck hour modelling efforts.